Hello all! Happy 2017! 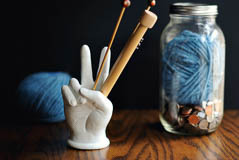 Welcome to the newly-minted Wool, Needles, Hands blog (formerly The Greenhorn Knitter). I know I’m a little late on a “New Year Goals” post, but what the heck. The last few weeks have been full of planning and mulling around new goals and putting some things into action and I am just now ready to hit the ground running. If you’ve been a reader of my blog for any length of time, you may know that I am a new stay-at-home mom. My son is now two, so I’m going on two years in this “field”. I couldn’t be happier with my choice to be home with him. My life is full and I am more creative now than ever. The juices just seem to boil. Since I’ve had this time to learn about myself and develop creatively, I’ve come to realize that this passion for knitting and fiber could potentially become something so much more than a hobby. This year is my year to realize that and put words into action. Here are my goals for 2017. Goal 1: Participate in at least two KALs! I am so excited about this. All last year I watched everyone knit boxes of socks and shawls and all sorts of lovely knits and I felt a bit left out. So I’m primed and ready! I am participating in Kristin’s (from the much-loved Yarngasm Podcast) Box of Socks KAL and the Find Your Fade KAL by Andrea Mowry. I’m a little late on the shawl, but I can make it. Photos soon to come. Goal 2: Try my hand and hand-dying yarn. Because, why the hell not? Materials have been purchased and I am in the process of setting up a dying station. Again, photos are on the way. Goal 3: Finally learn how to crochet. Because….Granny Stripe blankets. Goal 4: Create two original knitting designs. I have some in the works, but they need polishing. This is the year to follow them through. Gaol 5: Learn to Brioche knit. This is such a gorgeous form of knitting and I simply cannot let myself develop any further as a knitter unless I try my hand. Goal 6: Put my Janome sewing machine to use for much more than home textiles. I want to sew at least one garment from a pattern. Goal 7: Shhh…this one is a secret, but it will be revealed in due time.